Buford Betty: A Life-Changing Giveaway! The very first thing I would do is give it to others. Tithe it. It's the one thing missing from my budget right now and yet it will make all of the difference. Thanks for the giveaway, I'm stoked! No question! Start saving for infertility treatments! Excited about the giveaway! Put the money into savings! I would split between giving some away and adding more to my savings. Finish paying off our last credit card then any extra would go toward our baby emergency fund. With my extra money, I would put it towards our mortgage. Right now that is the only debt we have and it would be nice to get rid of it. Actually, depending on how much extra I had, I would also try to add some to our daughter's college fund and our savings account too!!! If we found ourselves with extra money we'd SAVE IT! Save, save, save, save, save for the unexpected! Thank you for the opportunity to win! I would definitely put it in our savings. Thanks for the great giveaway. I'd use the extra money to pay off student loans. Great giveaway! I would put it into savings - we are trying to build up our home downpayment savings account! I would use the extra money to pay off debt as soon as possible. Thanks for a great giveaway! I'd save, save, save it! If we had extra money, we'd save it to help pay down our mortgage. Thanks! I would love to start a vacation fund- we would love to go to Hawaii again! I would put it towards paying my car loan off-we're so close!! Love the idea for the giveaway! 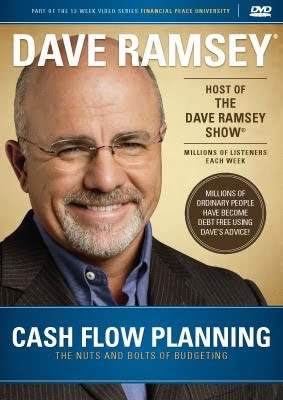 I have heard great things about Ramsey, and the hubby and I were thinking of signing up for Financial Peace University at our church this month. It would definitely go into savings! What a great giveaway! I would put the money towards our Master Bath renovation project. Thanks! I am a relatively new reader ( thanks to suburban princess). Love your blog! I would put it towards my house...something special to make this place feel more like our 'home'. We are Dave fans too so it would go towards the student loan. But if this question where a 'where would you splurge' with a little extra money - it would go in the vacation fund! Put it towards the mortgage. Thanks for the give away! Trying to have a family is #1!!! Towards it and after, because there will be an after! !